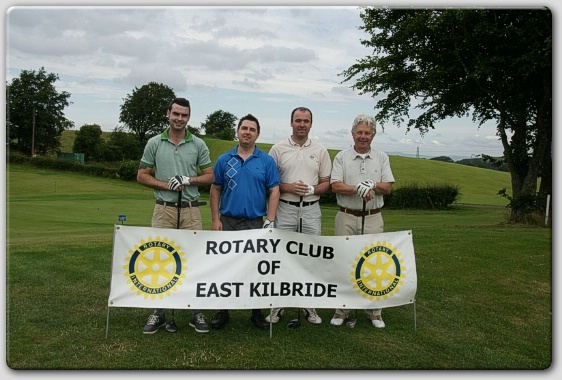 East Kilbride Rotary members and guests played for the Rotary club Rhu trophy at Drumpellier golf club. 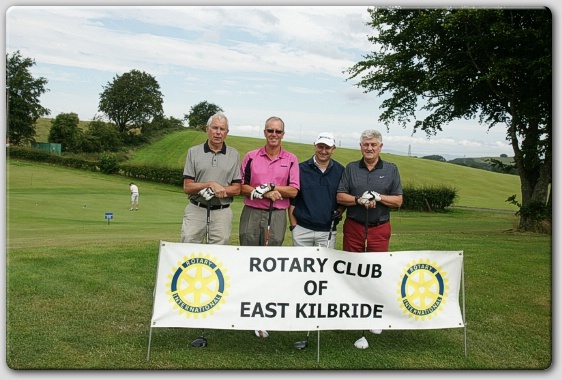 They enjoyed a great day with excellent weather, the event was won on the day by David Knox with Jim Montgomery 2nd and John Cardno 3rd. 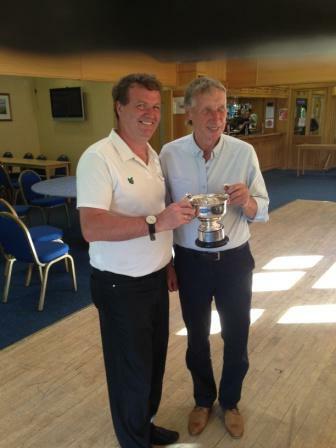 The best Rotarian player on the day was John Cardno who therefore was the winner of this years Rhu trophy. After the golf everyone enjoyed an excellent meal at the golf club which must be commended for its excellent hospitality and golf course. 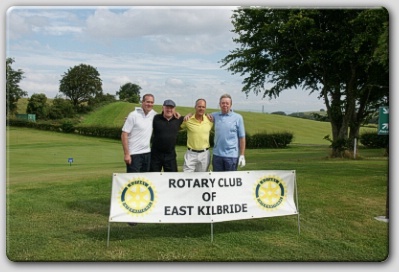 "The Ryder Cup Rejects" were first to tee off at East Kilbride Golf Club. 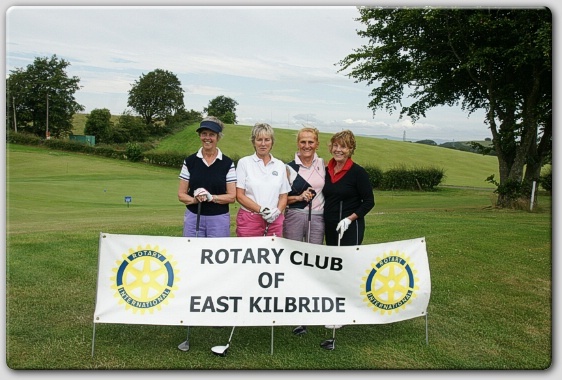 sponsored either by local companies, Rotary Clubs or individuals. Tom Tom Sat Nav to 4 ball gifted by golf clubs throughout Scotland. Included was a special raffle donated by Phoenix MG who donated the use of an MX5 for weeked and an overnight stay at the Cardrona Hotel. 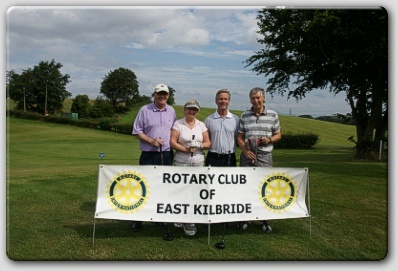 The winning team was Gordon Campbell Painters and Decorators comprising Gail and Gordon Campbell and Irene and Danny Morton with a score of 127. 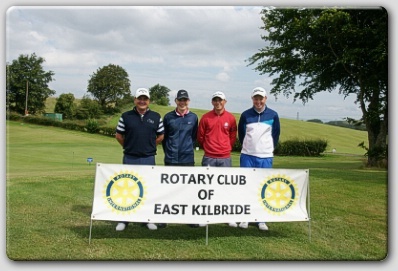 Second was team Gordon Russell comprising A Ronny, Stevie Morrison , Alex Henderson and Tom Leith with a score of 128 and coming in at third with a score of 132 was team James Murray made up of James Murray, Darren Cochrane,G Grimsby and W Heron. 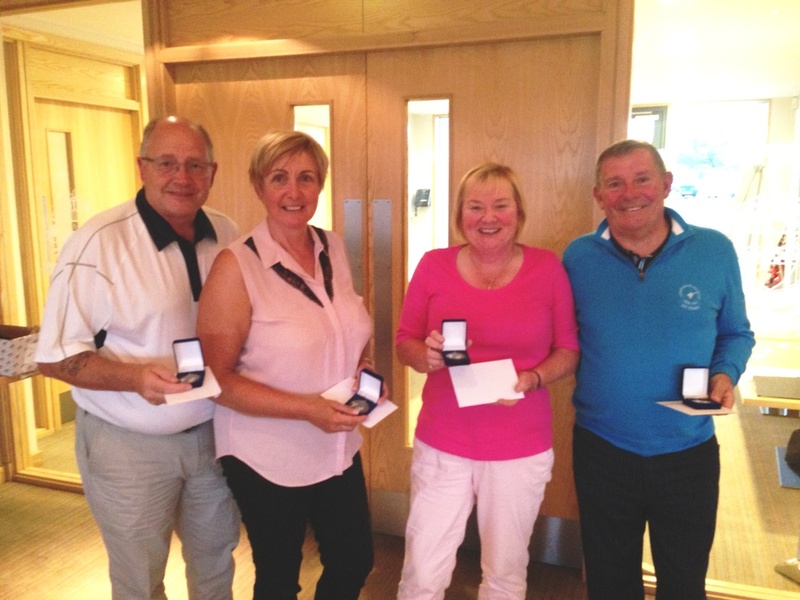 Longest Gents drive was won by David McLaren and the ladies longest drive by Jean Brennan. Nearest the pin at the 8th hole was David Mclaren and Mitchell Ronald, the youngest player at the event and son of local golf professional Craig Ronald won nearest the pin at the 17t hole. 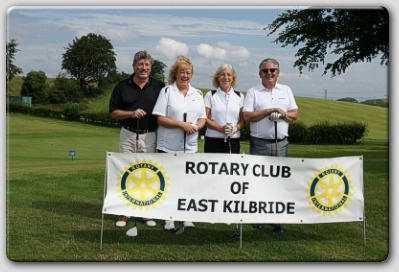 East Kilbride Rotary Club President , Archie King, wound up the evening thanking David and Gail Brown and Jim Moretti for organising the AM?AM, the staff and catering staff for the excellent hospitality, the lady members who welcomed the teams as they arrived and compiled the scores. 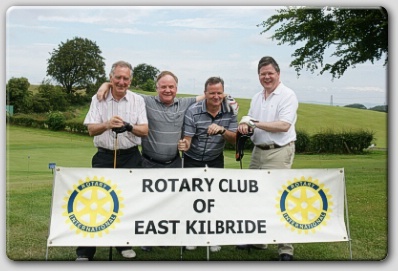 A very generous sum of £5300 was raised and will be shared between Dementia care at Pine Crescent and the Rotary Club's "Toys for Kids". 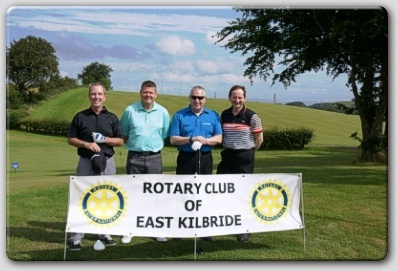 Nine club members entered the competition for the Taylor Salver at East Kilbride G C on 28 August and the sun did smile on the righteous, as the heavy rain disappeared ten minutes before the first tee off, and playing conditions were perfect for the rest of the day. 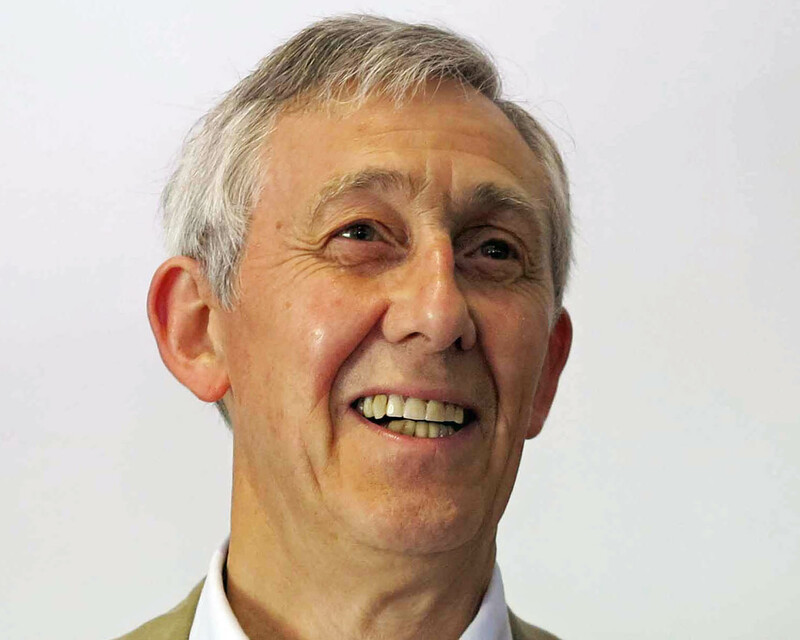 The good conditions were reflected in the scoring with almost all the players scoring over thirty Stableford points, but the clear winner with a magnificent score of 36 was Ian Macpherson whose steady play throughout his round proved the old saying about wine improving with age. Playing in the same group was the runner up, Liam Donnelly, who scored 33 points, the same as newcomer Russell Gill who finished third due to a slightly poorer inward half. 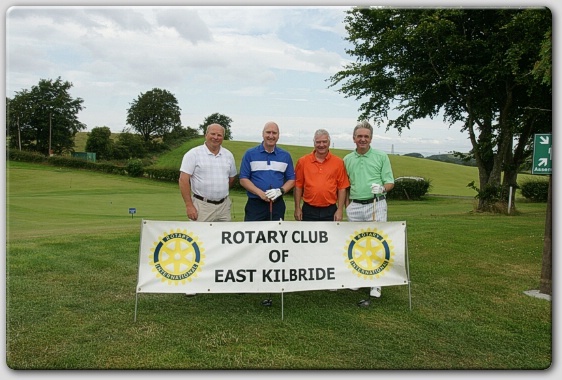 The other winners, who also received their prizes after a fine dinner and fellowship in the golf club, were Jack Blackwood whose was nearest the pin at the 3rd hole, and Jim Moretti whose drive on the 9th was the longest of the day.